This year the club has opted for the Rigel model from Macron as a replacement for the current blue/yellow kit. It offers best value for money given the limited opportunities for wearing it (colour clashes and so on) and the relatively low number of retail sales. You can see the options below (note that these are mock-ups for the moment and pending finalised design for logos etc). If you want to vote then please fill in the details below. We need your name and membership number to validate your selection. Looks too much like a tshirt, rather than football top. Price needs to reflect this. Pink looks like the leaders’ Jersey in the Giro d’Italia! Gets my vote. 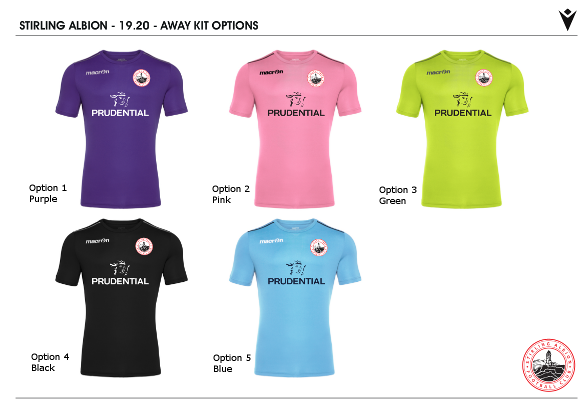 We can confirm that the Shorts and Socks will be the same colour as the selected shirt. Blue and black are the best of a bad bunch. If any of the first three are selected, they will be the worst shirts the Albion have ever worn. When did Stevie Wonder get a say in the shortlist of new shirts? 1, 2 & 3 would make us the laughing stock of the league. Has to be “all black” – Real Madrid away and the Kiwi rugby team swim to do okay in black…. Time for something different.Purple or green for me.